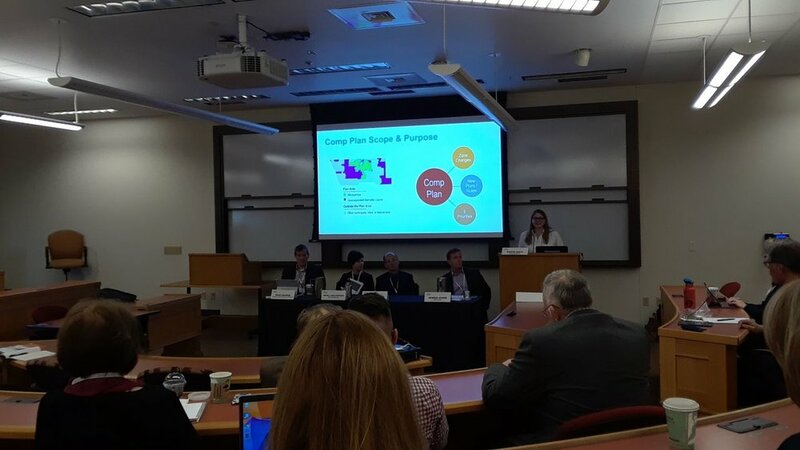 Albuquerque Long-Range Planning Manager Mikaela Renz-Whitmore talks about the city’s recently adopted comprehensive plan at the panels “What’s New in Comprehensive Planning” at the 28th Rocky Mountain land Use Institute on March 7th at the University of Denver Sturn College of Law. Other speakers spoke about recent developments in Aurora, Denver and Fort Collins. 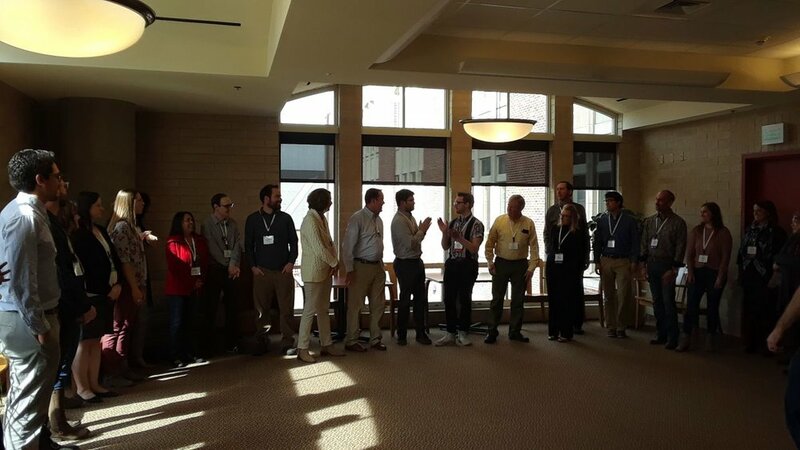 The 28th annual 2017 Rocky Mountain Land Use Institute was held at the University of Denver, Sturm College of Law on March 8th and 9th, 2019. The theme was “Western Places/Western Spaces - Designing for the Future: Building Enduring Value.” The conference program preamble asked the 400 attending to imagine the ideal community, and then queried, “Is it welcoming to all, regardless of income, ethnicity, ability, or age? Is it accessible and easy to navigate? Is it resilient and sustainable...What works and what doesn’t?” These questions are at least as old as Plato’ Republic, so I looked forward to hearing what contemporary voices from the Rocky Mountain West had to say. The Institute began after a generous breakfast, with an opening keynote plenary address by Sarah Williams Goldhagen, author of Welcome to Your World: How the Built Environment Shapes Our Lives. She perked up the recently-caffeinated audience asking, why does density have to be so ugly…why is there such a disconnect between the extraordinary western landscape and the often temporary, generic sprawling developments… and the historic main streets in towns that were built with pride and meant to endure? Can we get back to this ideal while we grow so that design creates places of lasting value? Wiliams Goldhagen cited the emerging fields of cognitive neuroscience, embodied cognition, cognitive linguistics, illustrating how humans respond to their environments. She also provided many examples of better design; from classrooms, hospitals, and biophilic architecture that improved performance, healing and mental health. She argued that design is not neutral and not a luxury, but it is a public good; concluding that we need to think of designing our communities as habitats for human development and happiness. After leaving the plenary, it was my intent to design the best day possible at the Institute; but this year, as always, it was a challenge to pick among the topics. My first session of the morning was a bit of a practical one, “Designing the Water Efficient Cities of the Future.” This appealed to me because I hail from Santa Fe, NM which has some of the highest water rates and some of the most effective conservation programs in the county. Moderated by Faith Sternlieb and Jim Holway of the Babbitt Center for Land and Water Policy, this session provided regional context about the transition from only supply side management to more recent demand-based conservation strategies in Colorado. The speakers provided examples of treatment as storm water flows from roofs to sidewalks, pavements and landscaping, into inlets, and eventually into natural areas that serve as open space, and enable infiltration, and provide habitat. This approach provides 70 to 80 percent treatment, more amenities, and costs no more than old style subdivision designs. It was encouraging to learn that Colorado mandates that water providers coordinate with land use authorities. The Growing Water Smart workbook and Western Resource Advocate guides highlight best practices that you can use in your communities. After lunch, I took in the opportunity to attend “Transit Hubs and the Future of Mobility Choice.” Moderated by Don Elliott, Director of Clarion Associates, the panelists emphasized that autonomous vehicles, scooters, and ride-share technologies and applications are disrupting the status quo. This requires that cities proactively set policies about street design and investing in infrastructure that places people first. There will be opportunities for adaptive reuse of parking, redesign of curbside passenger and commercial loading/unloading, determining the best use of the public right-of -ways, and contributing to livable communities. Both Denver and Portland, OR are already planning in this manner. A universal mobility app is already working in Helsinki, Finland. I rounded out the first day at RMLUI with a panel called, “What’s New in Comprehensive Planning,” because I wanted to know what we are doing to establish resilient communities of enduring value. Planners from Albuquerque, Aurora, Denver and Fort Collins extolled their progress using innovative public engagement strategies, and online tools to produce contemporary municipal visions that will guide and manage growth. All of these efforts focused on inclusive, informative and equitable processes, to create accessible plans that emphasized resiliency and sustainability. 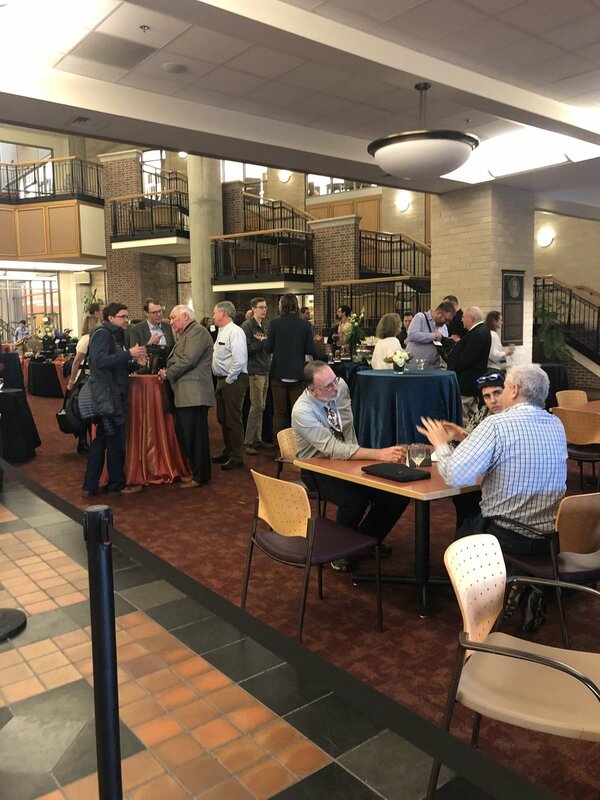 Folks enjoy great food at the reception after a full day of sessions at the 28th Rocky Mountain Land Use Institute, held at the University of Denver Sturm College of Law. The Thursday evening reception is a welcome tradition at the Rocky Mountain Land Use Institute conference, and it provided the opportunity to meet others and enjoy conversation over the fabulous hor’s d’ouevres while listening to a jazz ensemble. This festive function allowed me to consolidate a days-worth of learning while relaxing with old friends and new acquaintances. Friday was another busy day filled with four panels and a fascinating lunchtime presentation. While I was tempted to try an electric scooter or bike to explore the University of Denver campus, this in fact kept me off the streets from 8:30 until 5. I opted for a legal panel first thing since there is nothing like case law lectures to stir the soul after adequate infusions of caffeinated beverages. Jessica Lawrence, who is both an attorney and mediator in Santa Fe, and a member of the city’s planning commission, provided an overview of New Mexico cases including the nuances of annexation, and zoning for medical cannabis. David Foster and Jason Morris reviewed Colorado happenings where I learned about Rule 106 and how it plays out in Colorado land use conflicts. This made me feel pretty good about New Mexico. Participants in the “Residents Gone Wild” presentation get out of their seats and into the hallway to practice improvisational techniques. This untraditional panel at the 28th Rocky Mountain Land Use Institute, provided practical tips to save meetings from going south, from an attorney, a professional facilitator, a planner who is also a yoga instructor, and a comedian. Mid-Friday morning graced me with six enticing choices, and seeing that I already had my fill of legally/planny stuff, it was definitely time for something completely different, so I attended “Residents Gone Wild: When Community Meetings Go Off Script.” The first hint that this wasn’t your ordinary planning panel was that one of the “presenters” was a professional comedian who was the founder and artistic director of the Voodoo Comedy Playhouse. It seems that I had déjà vu thinking back on the many public meetings over my career, where in fact, there was certainly a bit of improvisation, although not comedic in nature. We started by leaving our seats and making a big circle in the hallway. This taught us to be present in the moment and how to remain engaged while also responding. It also taught us to quiet down after the folks in the next room complained about our enthusiastic noise. The panel also featured a planner who stressed a few Yoga techniques for mindfulness, tips from a professional facilitator, and an attorney who grounded the whole show. Lunch rolled around with author, entrepreneur and futurist Rutt Bridges talking about “Disruptions of Driverless Mobility.” Bridges just wrote a book, Our Driverless Future: Heaven or Hell, so I think you have a pretty good idea about his ruminations. This was a captivating exploration of current trends and changes that are happening in the near future as autonomous vehicle technologies become more prevalent. There is an economic imperative as automakers are investing hundreds of millions into these vehicles which will cheaper to produce and possibly safer to use. It’s a world of driverless trucks and robodogs that will deliver right to your door. It could mean redesigned communities where folks trade car ownership for enhanced personal mobility and lower costs; or it could mean a morass of competing modes vying for space on a 20th century transportation network. It makes one driven to stay tuned. After lunch, I left the Anderson Academic Commons and walked back across busy Evans Avenue (in the crosswalk of course) to the Sturm College of Law for the last two sessions of the day. I couldn’t resist the title, “The MacGyver Model: Resilience in Action”, so that’s where I ended up. Moderator Elizabeth Garvin, whose firm is Community ReCode, provided examples of what resilience looks like in the realms of wildfire, flooding, extreme heat and extreme precipitation. I learned about the Colorado Resiliency Office, and the Colorado Resiliency Working Group. Did you know that resilience strategies can provide a cost-benefit of $6 for every $1?! These approaches refocus planning from the strictly jurisdictional to natural systems such as watersheds, so it is planners with their unique skill sets who can implement needed changes. Lisa Loranger of the University of Denver Sturm College of Law moderates the “Fast and Furious Panel” at the Rocky Mountain Land Use Institute on Friday afternoon March 8th. Each of the 5 speakers had about 10 minutes to make their case, and spoke about topics ranging from Saving Prairie Dog habitat, to Legal Issues Concerning Cybersecurity and Smart Cities, to Principles and Strategies for Better Urbanism. The final panel of the day (and the conference) for me was “Fast and Furious” where six panelists each had about ten minutes to speak. The topics ranged from protecting prairie dog habitat, to mobility hubs and microtransit at the University of Denver, to legal and privacy issues of smart cities and homes, and the principles and strategies for better urbanism from examples in the ancient world, South America and Africa. Dwight Merriam rounded out the panel with his 2018 ZiPLer Awards which seemed to focus on bad planning decisions regarding ducks and people who like ducks. Dwight encourages us to send in nominations for 2019. I have previously noted that if you have a limited time and budget and want to earn lots of AICP Certification Maintenance credits but still have a great time, then RMLUI is the venue for you! It is truly impressive what you can learn and who you can network with over two full days with 40 concurrent panels in eight tracks, three plenaries, two lunches and an evening reception. There is typically a full day workshop just before the Institute that focuses on one topic. This year it was affordable housing: tools and approaches. Once again, this year’s Rocky Mountain Land Use Institute lived up to its fine reputation. Perhaps I will see you there next year…meet me at the reception! Dan Pava, FAICP is president of Western Planning Resources. He has practiced environmental planning primarily in New Mexico, Oregon and California over his 35 year career. Prior to serving on the Sustainable Santa Fe Commission, Pava was on the Planning Commission and the Santa Fe Railyard Development Review Committee.